This short science video shows a simple yet effective demonstration of electricity generation. 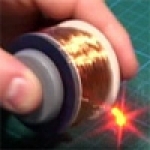 500 turns of wire are wound onto a 35mm film can and the two ends are attached to an LED light. A strong magnet is placed in the can and the lid fixed back in place. The generator is based on the principle of Faraday induction where a changing magnetic field creates (induces) a voltage in a coil of wire. Shaking the can causes the magnetic field to change with time and so generates electricity in the coil - the LED lights! Please see link to article below to be used with this film. Article to accompany this film.